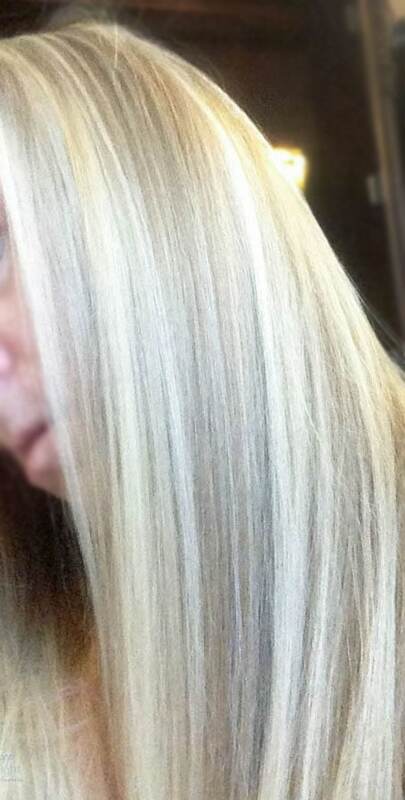 Shiny hair can be difficult to achieve on hot, humid days. Using the right products and techniques can help increase your chances of winning the battle of your hair vs. the weather. Post sponsored by Lunchbox. Opinions are 100% my own. I have said many times that I have thin hair. My friend/hair stylist has corrected me. I have fine hair, not thin. Meaning that I have a lot of hair, but the individual strands are fine. Parts of my hair are wavy, and other parts are stick straight. All of it gets frizzy in the humidity. I know I am far from alone in this since I see the majority of my friends posting about their humidity woes. Summer is not over, and we still have many events coming up where we want to dress to impress. Here are some products and practices that help me tame the beast that is my hair. 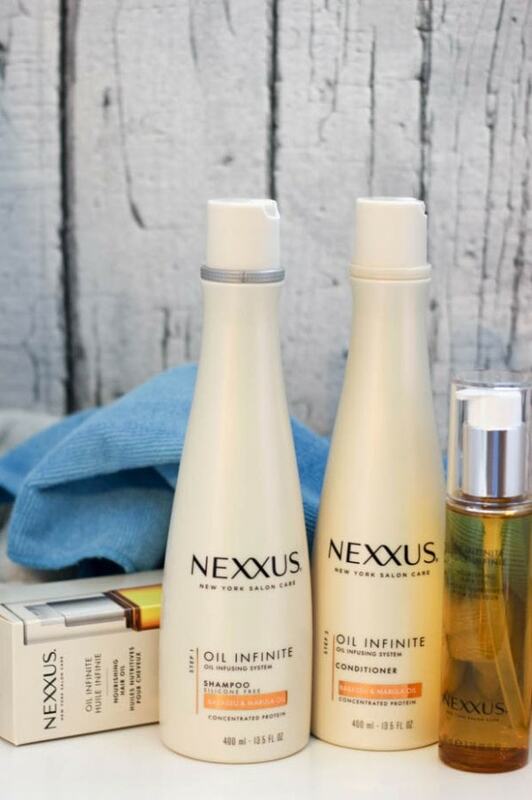 Shampoo: Use the new Nexxus® New York Salon Care OIL INFINITE Rebalancing Shampoo to nourish your hair deep within. The silicone-free formula works to rebalance hair by rebuilding broken protein bonds. It’s formulated with a blend of oils to smooth your hair, leaving it ready for conditioning. 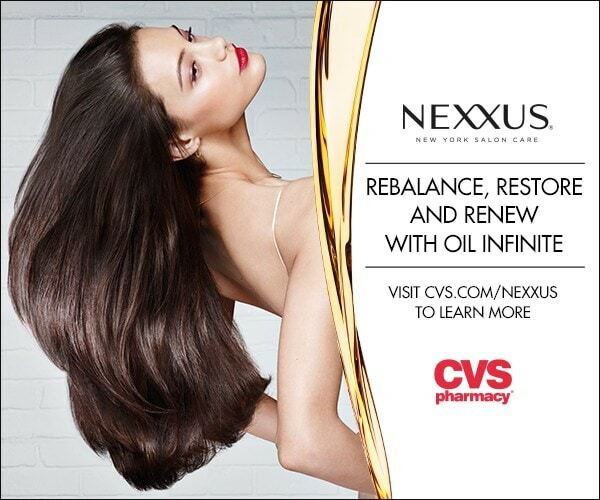 Conditioner: Nexxus® New York Salon Care OIL INFINITE Restoring Conditioner is the next step toward luminous locks. It nourishes from the cuticle to the end for a polished and sleek look. The formula strengthens the hair’s protective barrier and helps to restore lost protein. The best part is that it leaves the hair easier to detangle, which makes the whole styling process go a bit smoother. Oil: Yep, oil. Even though my hair is greasy, Nexxus® New York Salon Care OIL INFINITE Nourishing Oil is not to be feared. With a blend of precious oils, including Babassu, Marula, Buriti, Macadamia, it increases the hair’s manageability without leaving a gross residue. Apply to damp hair before styling. Just one pump on the middle and down to the ends of hair will allow your brush to glide with ease. You can use on dry hair, too, to reduce frizz and smooth the hair. Blow dry: For the smoothest look, I have to blow dry my hair with a round brush. I start with the bottom layer and clip the rest of my hair up. Do each layer on the hottest setting until it’s completely dry. There’s no rushing through this part if I want to avoid the frizzies. Give the hair a shot of cool air once it’s dry to seal the deal. Iron: Depending on which look I am going for, I will use a flat iron, curling iron, or curling wand. Usually after using the blow dryer and round brush combo, my hair looks pretty good. If I am going out or want to dress to impress, I will add curls or waves. Everyone’s hair is different, but these are the steps that work for me. Try the new Nexxus® New York Salon Care for yourself. The products are great for most hair types and don’t fear the oil – it’s your ticket to luminosity! I can honestly say that my hair never felt silkier after using these products. 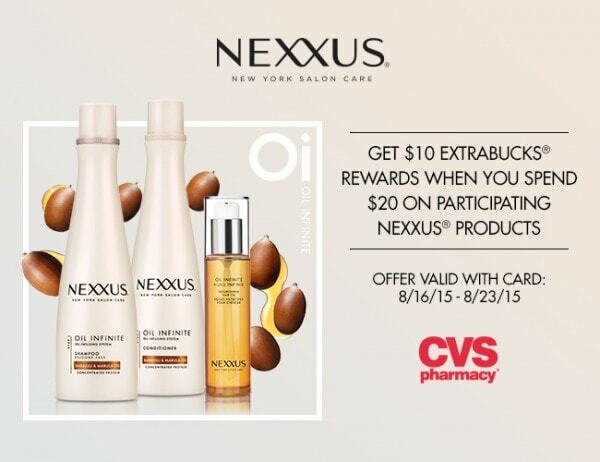 Between 8/16/15 and 8/23/15, take advantage of a special rewards offer: Get $10 extrabucks® rewards when you spend $20 on participating Nexxus New York Salon Care products! Do you have any shiny hair tips? Nope, I don’t have any shiny hair tips, just use products that promote shine. I am a fan of Nexxus, I think they have great products. I’m looking forward to trying the Nexxus® New York Salon Care OIL INFINITE Nourishing Oil. Thank you for sharing this post. I keep my hair short since I swim 3 times a week. I have lots of white hairs and they sparkle on my head. Your hair is gorgeous! I have always bought cheap shampoo. This past week I bought a more expensive one just to see what it was like and I will say it is SOOO Much easier to brush through my hair. Thanks for this other tips I will try them out. You have beautiful hair. I haven’t heard of this brand. I will check this out. I have naturally curly hair and get keratin treatments to get rid of the them. I am way familiar with frizzy hair. I occasionally do a hot oil treatment at home to help combat the frizz on very humid days. I will have to check out Nexxus’ Nourishing Oil the next time I go to CVS. Sounds like they are great products. I will have to try them sometime for my frizzy hair. I’m going to have to try out these products. I hate when I have frizzy hair, especially in the summer. You have really beautiful hair!! I also have fine hair! I will have to try out these products! Mine is always a little frizzy. I have fine hair as well and feel blow drying with a round brush really gives me some much needed extra volume. I love the idea of a nourishing oil. I love Nexxus. It smells SO good but it’s SO darned expensive. I love Nexxus products too! I think you hair looks like healthy pin straight silk! 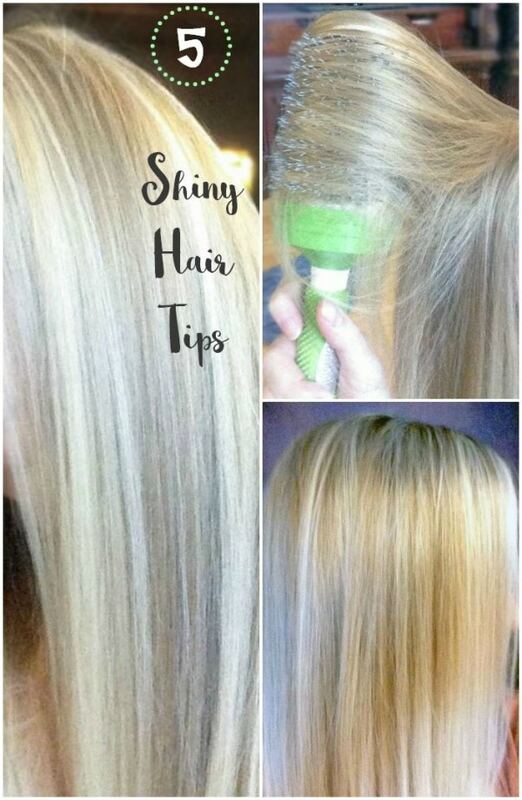 I will have to try these tips to make my hair shiny. It has been so hot and humid here my hair has been lifeless. My Daughter loves using Nexxus products. Well, I happen to think you have fabulous hair. : But that nourishing oil sounds amazing. I am sure it smells amazing, too. Thanks for sharing. Nexxus products are great for controlling my frizzy hair. My hair has been so dry this summer. Using the oil in my hair helps keep my hair looking smooth. I need to try out these products! They sound amazing for fine hear, summers are tough on my hair every year! The Florida humidity basically kills my hair! I need to give this a try since I haven’t used this brand yet! Humidity drives me nuts as my hair wants to go all over the place and frizz out. This sounds like an interesting product to try so I can banish the frizz and gain some shine. These are great tips. I’m always game for shinier hair. Mine gets particularly bad after long days in the wind. Your hair looks great, and I believe that if a person uses the best hair care products, their hair will come out smooth and silky looking like yours. I am a fan of Nexxus hair care products! Wow, your hair looked amazing!! Im very jealous lol. I have all year round frizz! It makes me crazy, and takes so much work to try to get half as shiny as straight as your hair. But thank you for the review and great tips..I will definitely try them all and hope for great results like yours.